I once heard that there are three kinds of church members. There are the “Old Faithfuls.” What would churches be without them? God bless their souls! Second, are the “Once-in-a-Whilers.” They’ve also been called the “Up and Downers,” and even the “In and Outers.” They come one Sunday and stay away five or six. Then there’s the “Almost Nevers,” who show up for Easter and Christmas. Pastors know that Christmastime produces higher attendance at church services because all three of these groups are typically present. 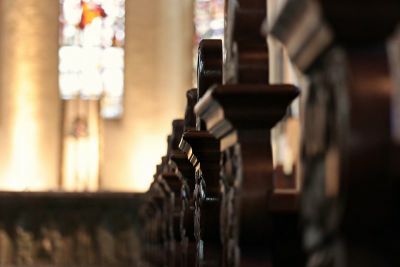 Church attendance is not a minor issue in the Christian life, as some might be tempted to think. Quite the contrary, the Bible commands, “Let us not neglect our meeting together, as some people do…” (Heb. 10:25). The frequency of our attendance can serve as a spiritual barometer. This is not to say that everyone who shows up regularly does so out of the right motives or a proper relationship to God. Nevertheless, it is to say that no one in right relationship to God fails to take church-going seriously or dismisses it as inconsequential. You know, I can remember when preachers of yesteryear used to ask congregants in their sermons, “Is your name just recorded on the church rolls or is it similarly written in the Lamb’s Book of Life?” The question rightly suggested that if an individual has an authentic relationship to Christ, it follows that he or she would want to be where God’s people meet for worship and plan for corporate acts of Christian service. The Scripture says, “We know that we have passed from death unto life because we love the brethren.” (I Jn. 3:14) One assurance of having been transformed by the grace of God is the love in one’s heart for other believers. There is an immediate bond with them, whatever their race, whatever their class, or whatever their background. Believers want to be with other believers because they have a mutual love for Christ. The Scripture adds in the following passage, “He that loves not his brother abides in death.” (v.15) In other words, there’s something amiss about one’s faith if there isn’t present a deep affection for the people of God and a passionate desire to be with them. In fact, the absence of such is indicative of the need for a spiritual rebirth. When I was in my early teens, there was a nice old lady in my community who was always asking me to church. If I saw her somewhere, I would duck and hide because I knew she would invite me. She was so nice I could hardly turn her down. I think I went with her once or twice, but I really didn’t want to attend. Church was the least of my interests. Everything changed, however, after I surrendered to Christ a few years later. No one had to invite me to church anymore. I couldn’t wait to go. If for some reason my parents had to be away and couldn’t take me as usual, I would call that nice old lady to see if I could catch a ride with her. I didn’t want to miss an opportunity to study the Word of God, pray, and worship with other Christians. Now it’s possible for a genuine believer to drift from the Lord. It’s possible for a believer to backslide, slip into sin and doubt, and consequentially become a “Once-in-a Whiler,” or an “Up and Downer” or “In and Outer,” even an “Almost Never.” Nevertheless, if one actually knows the Lord, he or she better get back on the right track, lest the Lord wield his hand of discipline. The Scripture teaches, “For the Lord disciplines the one he loves, and he chastises everyone he receives as a son” (Heb. 12:6). The Lord chastens only those who have been spiritually regenerated, not the people who have never been reborn by faith in Christ and into the family of God. God will deal with the unregenerate in the final judgment. But the Lord will not indefinitely tolerate the waywardness of his own children. The Heavenly Father insists that they be partakers of his holiness. His chastening is not out of retaliation but lovingly applied for his children’s cleansing and the producing of righteousness in their lives. Believers who are willfully disobedient and negligent of the things of God can expect the Lord to employ his rod of correction, which doesn’t exclude the way they practice their church attendance either. It is, however, the “Almost Nevers” with whom I have the greatest concern. It seems as though they go through life with just enough religion to inoculate them from the real thing. I fear certain ones may be deluded about their relationship with God, wrongly assuming their church membership is enough to save them? I’ve talked to numerous people about becoming a Christian. If you ask some people about this, they will say that they belong to this or that church. Or they’ll reply that they think they are a good person, even better than many who attend church habitually, especially the hypocrites. Perhaps this article causes discomfort? It’s not meant to offend or judge anyone. It is, nonetheless, unapologetically offered for taking spiritual inventory. What about your church attendance? Are you an “Old Faithful,” a “Once-in-a-Whiler,” an “Up and Downer,” or an “In and Outer?” Or maybe you’re an “Almost Never,” planning to make your annual appearance at church this Christmas. Of course, the deeper and more important question is whether you truly are in right standing with God? If you were to die within the next five minutes, are you sure you would go to heaven? Have you turned from your sins and received Christ as your Savior? Are you walking with Christ each day as the Lord of your life? Can you answer affirmatively to these queries? Christmas is a good time to make a decision and settle matters with God.